Vice President Biden on June 7 announced an additional $48 million in assistance to help the Ukrainian government conduct key reforms, build law enforcement capacity and strengthen national unity. Pending consultation with the U.S. Congress, this assistance will follow the $1 billion loan guarantee signed on April 14, a $50 million crisis-response package announced by Biden on April 21 and $23 million in security assistance announced to date. When added to previously budgeted funds, the United States is providing more than $184 million in assistance to Ukraine this year in addition to the loan guarantee. 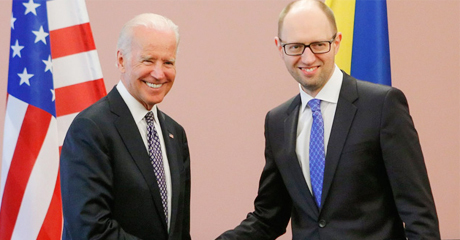 Biden, shown above June 7 with Ukrainian Prime Minister Arseniy Yatsenyuk in Kyiv, was online pokies in Ukraine to attend the inauguration of President Petro Poroshenko that day.